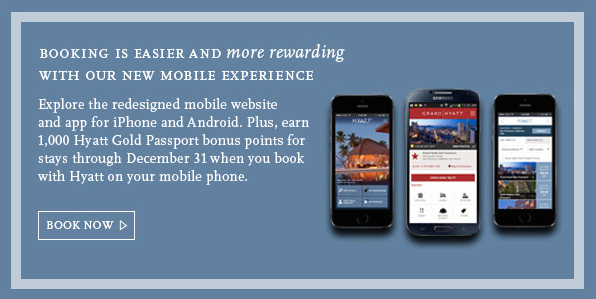 Hyatt is currently offering 1,000 bonus points per stay simply by booking with their mobile app. To earn 1,000 Hyatt Gold Passport points under this offer, you must book a new stay on an Eligible Rate through the Hyatt App or the Hyatt Mobile Site. Both reservation and stay must be made and completed from October 1, 2014 through December 31, 2014 at any Hyatt hotel, excluding M life resorts. Eligible Rate is defined in the Hyatt Gold Passport terms and conditions. All hotel reservations are subject to availability and must be made in advance. Hyatt Gold Passport membership at time of stay is required and members must provide their membership number and be a registered guest of the room. Membership is free and enrollment is available at goldpassport.com or at a participating hotel. Only one 1,000 point bonus may be earned per member, per stay, regardless of how many rooms are booked. This offer is subject to the complete terms and conditions of Hyatt Gold Passport. Please allow 2-3 weeks after stay is completed for points to be credited to account. Promotional blackout periods may apply due to seasonal periods or special events, and normal arrival/departure restrictions apply. Hyatt reserves the right to alter or withdraw this promotion with a suitable substitute offer of equal value (if legally required) at any time due to actual circumstances. We endeavor to use our best efforts to provide advanced notice on the website. Please see the website for updates. ©2014 Hyatt Corporation. All rights reserved.